One of Chelsea's biggest stars to reject the advances of Real Madrid to stay at Chelsea? Eden Hazard will reject the reported advances of Real Madrid this summer to stay at Chelsea and continue to work with Antonio Conte as he looks to mount a challenge in the Champions League. Ask any Chelsea fan of their opinion of Eden Hazard and you would find a simple answer, he is the best player at our club and in the Premier League. 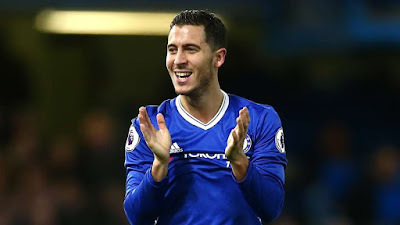 Having won the Premier League Player of the Year award two seasons ago, an award voted for by his fellow professional players up and down the country, Eden Hazard is sure to be nominated once again after rediscovering his form this season under Conte and he literally makes people get up off of their seats with anticipation every time he is given the ball and looks to take on his opponent. I will admit to being concerned of his future at our club ever since he won that award two seasons ago with his name being linked to Real Madrid. There is a supposed saying in Football, “If Real come calling, you simply do not say no!” and I have waited with anticipation of exactly that happening for two seasons now and expect the side from the Spanish capital to finally make an approach this summer. Now this speculation has not been helped by a quote given by Hazard himself at the beginning of the season when he spoke of his poor form last year and that fact that he owes the club and the fans even better performances than when he won the Player of the Year to make up for it. He added that he would only consider leaving Chelsea when we have won the Premier League again – which could be this season. This is where Antonio Conte comes in with a simple tactical change that has changed the fortunes of the team taking them to the top of the Premier League ten points clear of our rivals with eleven games to go. Not only has he changed the fortunes of the team as a whole, but he has also given Eden Hazard exactly what he has been asking for in the last few seasons by giving him licence to roam about the pitch. 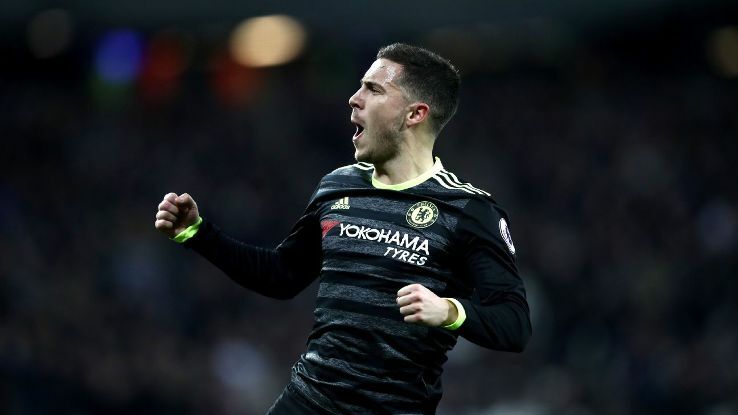 The result has been fantastic with Eden Hazard now playing better than ever and becoming much more of an influence in games as he looks to break his goal scoring record at Chelsea being three short of his best tally. It’s having this licence to roam that has really had a positive effect on Hazard and his reported excellent relationship with Antonio Conte. Now you have to wonder if he would be given the same freedom in Madrid with Cristano Ronaldo and Gareth Bale as potential team mates. It’s understood that Ronaldo wants to play as a central striker next season with the departure of Karim Benzema increasingly likely as they like to adopt a rigid 4-3-3 formation in which Hazard would be asked to play wide left. No one expected the impact Antonio Conte would have on Chelsea so soon into his first taste of management outside of Italy and no one expected the impact it seems that he has on Eden Hazard with the Belgian now willing to stay in his free role and to continue to work with the passionate Italian. It’s vital that we keep Eden Hazard at Chelsea if we are to continue to challenge for top honours and that will hopefully include the Champions League next season!